Last weekend we decided (only about 10 days before) that we wanted to go for a trip to the South of England. I got to choose the hotel and so we went to Maidenhead – as that’s where I grew up and I haven’t been back for a long time. I did the driving, because I enjoy long distance driving; listening to music and singing along! On the journey down we stopped a few times due to car issues but it also gave us the chance to stretch our legs and get some lunch. There was barley any traffic, given that it was a Friday and we were traveling through rush hour, we got very lucky! 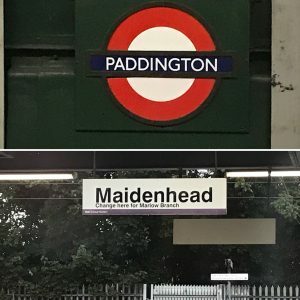 When we got into Maidenhead, Martin had to put up with me gasping and telling him about things he didn’t really care about (like where my friends live, or used to live etc). After checking into the hotel we went for a drive and I had to show him my old house and my old school from when I was little. It was really nice and I really enjoyed it. This little trip made me so happy, and I’ve come back feeling happier than I have for a while. We did have a few issues with the hotel on the first night – the staff were very slow, the food was cold etc, but this wasn’t so much the case for the rest of our time here. The room was very clean and you can tell that it’s a new build. It is in a great location, although there is no on-site parking there is a small carpark just 2 minutes walk away or there is a big multi-story at the Sainsbury’s. 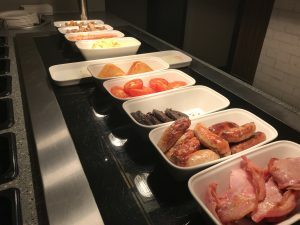 We stayed at the Premier Inn in Maidenhead town centre for 2 nights. 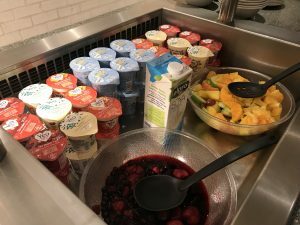 On Saturday we got up super early – we were early for breakfast and the first people downstairs! We both had a full cooked breakfast and a pancake or two (we are technically on holiday). We then proceeded to drive to the station and get our tickets to London. We were spending the day so opted for the travel card so we could use the tube as well. For an adult return and use of the tube it cost us £17 each. The train only took about 45 minutes, and we got into Paddington. Doesn’t that just make you think of the bear, I love that movie. Being us we already had a plan for the day and knew everything that we wanted to do. We had our Merlin Annual Passes with us and so started our day in the London Sea Life Centre. This Sea Life Centre is HUGE! The tanks are massive and there are loads of sharks and huge turtles. To get in you walk on a glass floor that is actually the top of a tank, and it’s pretty cool. I love fish, I could sit and watch them swimming around all day, I think rays are my favourite. There are lots of interactive sections and tunnels, huge tanks and little tanks and a part when you can touch and hold the starfish (just like the Blackpool one). 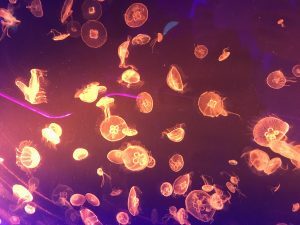 They also have super cool jellyfish, where the tank changes colour and therefore the jellyfish do as well. I would recommend this for anyone to do, it takes around an hour or two depending on how long you watch the fish for. There are also talks throughout the day that you can go and watch. Next we went on the London Eye, personally I think the best time to go on this is when it is dark and you can see London all lit up. We went on it in the morning as we had other things to do and didn’t want to be getting back really late. The London Eye is good for a little sit down whilst seeing the sights. It is calming and relaxing. You are in a pod with about 25 other people, but they are more than big enough! It is a bit of a weird sensation because it moves so slow but it doesn’t feel like you’re moving. Again this is included on our Merlin passes – I really recommend getting a Merlin pass and just going to places!! After having a sit down on the Eye and relaxing a bit, we went and got tense at the London Dungeons. Now even with a Merlin pass you still have to book in for a time slot, but you can just book for the next available time. The queue goes down very quickly and your group starts walking around the dungeons. It’s about an hour and a half of being tense and expecting people to jump out at you, or pick on you but it is fun. I really hate scary things but the dungeons are great fun. I would NOT recommend taking children, as some of it is loud and dark and can frighten them. There was a 12 year old (she looked 12) in our group who kept getting very scared and covering her ears. There is also a ride at the beginning where they say you get wet but I didn’t even get a drop on me. However climbing out of the boat – typically- I got picked on “you in the grey jumper!” Great, knew I would be picked on. But they won’t make you do anything you don’t want to do, and they usually just ask questions where you can answer yes or no. There are LOTS of different rooms exploring the history of London, and like I say I hate scary things (I can’t stand scary films) but the dungeons I do find to be a lot of fun. We were also given a free drinks token at the beginning that you can use at the Tavern at the end. The free drinks on offer were, a gin and tonic mix, a cask ale or an apple juice. I don’t like gin but the gin and tonic was nice and didn’t taste alcoholic (it must have been, you just couldn’t taste it). All in all, I recommend it to anyone over the age of (I would personally recommend) 15. When you’ve been on your feet, walking around and haven’t eaten since breakfast you (we) start to get hungry after 3 attractions. So we got the tube to Covent Gardens and went for a Five Guys. We have been to London a fair bit, I used to live in Winchester so we would go to London often which is why we know where most things are. If you do get stuck then Google becomes your best friend. You can simply find out what the nearest tube station is to wherever you are going and what line that station is on. Google can also recommend a route to take if you do need to go via two different tube lines. This is possibly one of those times where we REALLY enjoyed Five Guys and went for a full sized burger and not a little one and had fries as well. We must’ve been hungry! Whilst having lunch we had a little Google about Madame Tussauds and it’s closing time. We had enough time so we hopped on the Tube again over to Baker Street, and it is about a 3 minute walk to Madame Tussauds. Now we’ve been before, we’re not overly fussed about the wax works, however there are LOADS and you can spend hours here. Again this is included in our Merlin passes just like the one in Blackpool. Whilst we walked around and had a little look at what was new, we found this Alien Invasion “attraction”. No idea what it was we stood in the queue. Figured we may as well do the new things since we were here! Anyway… We queued for about 20 minutes or so, we had no idea what to expect; was it going to be a ride? Would it be an actor attraction? Would it be like a 4D experience? Well, this was not even worth the 20 minute queue. You walk through two rooms where an actor in each room ‘panics’ and tells you to run. That literally is it! Not worth queueing for, not even worth just walking straight into in my opinion. Just skip this bit and look at the wax works!! There is a nice little ride in the middle, where you ride a black cab around London’s history (a nice version this time). Just like everything in London this Madame Tussauds is much much bigger than the others. We love going here not for the waxworks (even though that is its prime function), but for the mini ride and for the 4D experience. It is Marvel themed and really good. We both think that this is possibly one of the best 4D experiences that we have ever been to! You’re kind of lay back slightly and it is projected onto a dome which makes it more fun. Definitely bring children if you have them because they will love it. We didn’t want to have a late night because we knew we needed to be up early again so we headed back to the hotel. However there is A LOT to do in London, you can go shopping, see the sights, go to London Tower Bridge or the Tower of London and more. We have done all of these things before anyway and it was around 6pm (we got up at 6am) and were getting tired. If you want to do everything in London then I would say spend a few days as there is so much and you don’t want to be exhausted. We’ve been so many times and done different things every time so we called it a day. 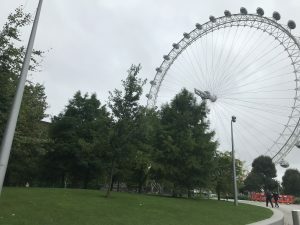 As with EVERYTHING Merlin attractions, all of these in London had photo opportunities (some had 3, some had 4), you do not have to do them if you don’t want to (we never do). Other than the Dungeons everything really is family friendly. There is also a Shrek Adventure, however we didn’t fancy going. If you have been then please do tell us what it was like. Maybe if we had a child then we would’ve gone! Don’t forget to check us out on Twitter and Instagram! Happy Travels. Previous Previous post: Hints and Tips for Saving. Next Next post: Long Weekend Away – Part 2, Legoland!